Gone are my days of awkwardly 'cleaning' my glasses on my dresses, tops and on one occasion, my cat because she was dryer than everything else in reaching distance. By 'cleaning' I mean swishing bits of fluff and grime around on the lens. Clearwipe Lens Cleaners have changed my life! By 'changed my life' I mean I can actually see stuff and you need to see stuff all the time when you drive and write and read and eat. Well, I guess you don't need to see to eat but I do like looking at food. 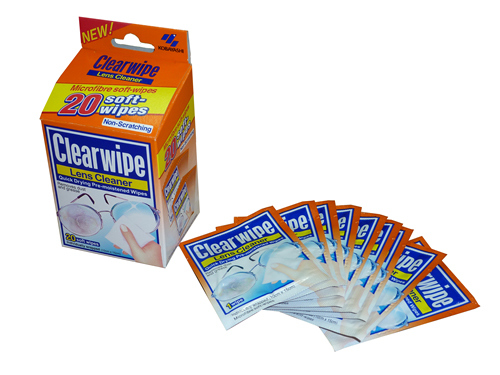 I didn't discover Clearwipe on my own. The lovely work neighbour from a previous life told me about these neat, individually wrapped miracle wipes that fit into my wallet, lego backpack and desk draw perfectly! Of course, this is the same work neighbour who told me about finding a knife in her yard and we both came to the natural conclusion that her dog was being initiated into a doggy knife gang.... so maybe you shouldn't take me seriously when I tell you these Clearwipe Lens Cleaners are a must-have for all eyeglass wearers! Available from, like, all pharmacies and some super markets ...how have I not seen them before now? I guess my glasses were dirty is how.